A recent study from Finland suggests that cholesterol-lowering drugs known as Statins may increase ones risk of developing the highly-preventable Type 2 diabetes by a startling 50% – even after adjusting for other factors. With the widespread use of cholesterol-lowering statin drugs, this news is not what many folks will want to hear. A 50% higher risk for Type 2 diabetes is a quite unfavorable consequence for those who are ‘reliant’ on statins for blood pressure or plaque buildup throughout the circulatory system. However, due to the many other conditions that can occur with diabetes, this correlation must be taken seriously. Particularly for the elderly who have very little diet discipline, the results of this important study ought to serve as a major wakeup call. It should be noted that some of the conclusions of this study read like the worst case scenario specifically for white men since the control group was made up of exclusively Caucasian males. Type 2 diabetes is already a major medical condition affecting well over 29 million people in the United States. With the advancement of age, the incidence rises very quickly. Significantly, there are many folks who are actually pre-diabetic or undiagnosed diabetics and who are also on statins. They especially need to be aware that the longer the period of statin use, the greater the potential likelihood that Type 2 diabetes will develop. The data of the aforementioned study seems to suggest that any individual who has a personal or family history of “impaired glucose tolerance” ( also known as pre-diabetes) ought to be very wary of using statins to control BP or lower cholesterol. Certainly the prescribing physician should be properly informed if there is a family history of blood sugar problems. 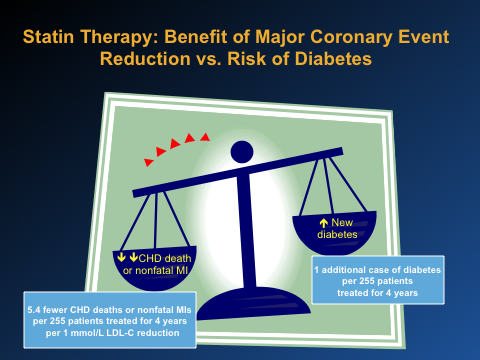 “If your risk for heart disease is high, the benefit of statin therapy is so important that most physicians and most patients, when it’s explained to them, will be willing to incur the increased risk of diabetes in favor of the added benefit to preventing heart attack and stroke,” Goldberg said. There is no question that both doctor and patient can be put into a demanding predicament the more diabetes becomes a reality for a heart attack or stroke patient. The tradeoff between the two treatment regimes will undoubtedly present choices which will be as conflicting as it is challenging. However, there is a way out for those who are confronted by this as well as by similar competing health challenges. That way out concerns the serious consideration of positive changes in lifestyle, as well as of natural treatments. Toward that end, diet and exercise are the best places to start since each can contribute to the mitigation of both conditions. The only realistic way to deal with this medical conundrum is to adopt some fundamental dietary changes. Reducing red meat intake and embracing a plant-based diet would be especially helpful. Engaging in an exercise regimen that will systematically encourage weight loss, heart rate reduction, and blood pressure moderation would also assist toward a durable resolution. Litigate, class action law suit. The Doctor did not inform me of the risk. I did not have informed consent. Satins are given out like they are candy. Time to put a halt to this by litigation. Litigation is the only way to get their attention.